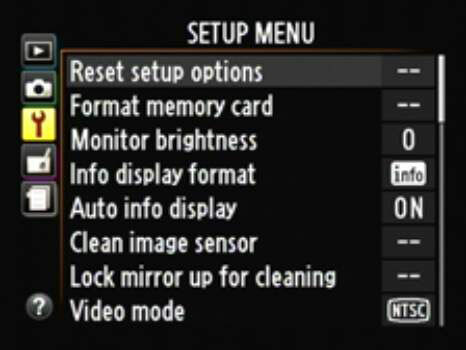 Your dSLR camera’s main setup options are in the Setup menu. Each tab (here they’re vertical) has its own unique icon. In this case, it’s a small wrench (or spanner, if you prefer). Date and time: Set the date and time so that all your photos have the correct date and time imprinted in their metadata (data stored in a header that can be access and read apart from the image itself; examples data include the camera make and date and time of the exposure). Some cameras show the date and time when turned on. 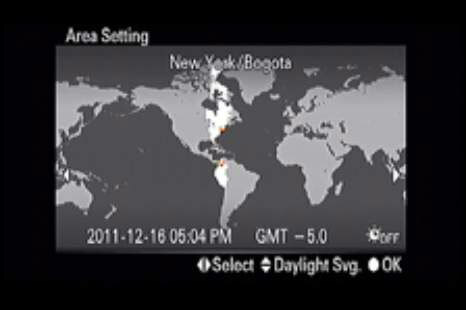 Check to see whether you can set the time zone, too — but remember to change it if you travel. If so, you often see a snazzy map. Sometimes you simply choose your zone from a list. Language: Your camera can’t speak to you (not yet, anyway — although if Apple made a dSLR, it probably would). Specifying the language makes it possible to read all the menus. All the options might look interesting, but you should choose the one you can read. Some cameras toss only the file structure and don’t reinitialize the card. If so, you may be able to rescue lost files before you overwrite them. To protect your privacy, be sure to reformat your card as aggressively as possible if you ever sell it or give it away. File naming and numbering: This setting determines how the camera names your files. The camera counts every photo you take and puts the number to a preset base filename. You can sometimes change to a different base name and change the camera’s behavior when it starts over on the renumbering. 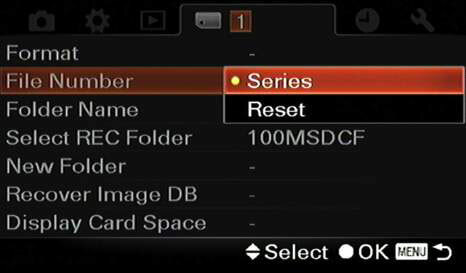 You can’t change the name, but you can force the camera to start over by choosing Reset. File structure (folders): Some cameras let you change the way folders are named on the memory card from a standard form (sequential numbering) to a date form (based on the date you take the first photo in the folder). 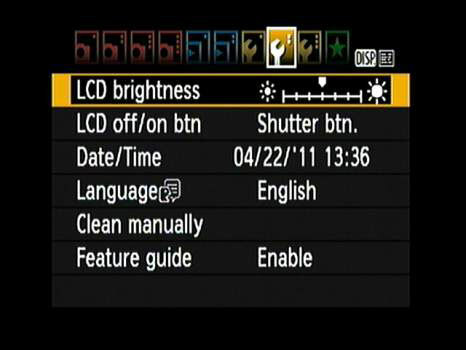 LCD brightness and color: You may be able to dim or brighten your LCD monitor. Dim the beast if you’re taking photos at night or somewhere in low light, where a super-bright LCD monitor might be distracting. Lowering the brightness of the LCD also decreases battery drain. Movie options: You can typically set up the size and frame rate for movies. Cleaning: In some cases, you can activate the camera’s self-cleaning mode — which may include shaking and automatically cleaning the sensor. In other cases, the mirror locks up and out of the way so you can clean the sensor yourself. You may have the option to choose either method. 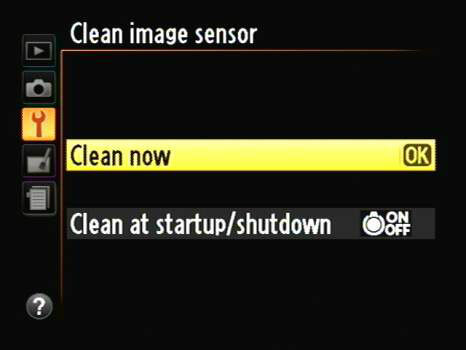 You can clean the sensor now or set it to clean every time you start up or shut down. Whatever you decide, be careful if you clean your camera yourself! You can ruin your camera if you scratch the low-pass filter that covers the sensor or the mirror. Don’t confuse Manual cleaning mode with mirror lockup (Nikon names it Mirror Up mode), which delays the photo more than normal after the mirror flips up to reduce camera shake from the mirror movement. Auto rotate (camera orientation): This setting records the camera’s orientation when you take the picture and stores the information in the EXIF information. When you review the photo or open it in smart software, the picture is automatically rotated to its correct orientation. The auto rotate option prevents you from having to turn the camera every time you review a portrait-oriented photo. It makes the photo smaller-looking, though. Video mode: Let the camera know what type of television, VCR, or other video device you might connect it to so that you can review photos. Grid: The grid in the viewfinder or on the LCD monitor is turned on or off. In some cases, you may be able to customize the grid by having more or fewer lines. Some cameras (such as the D300S) have a virtual horizon that acts like a level. If you turn it on, the horizon appears on the LCD monitor. Keep your camera’s grid turned on to help keep elements level within the viewfinder and to better frame the shot. 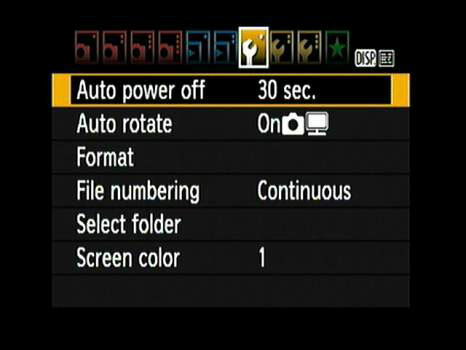 Auto power off: Have you ever accidentally left your camera on? You can automatically turn it off and save batteries with this option. Battery information: On some cameras, you have to identify a battery type. On others, this settings displays only how much battery life remains. Revert to default settings: Being able to automatically change all options (or a good percentage of them — see your manual for details) to their factory default settings is helpful. It helps you restore the standard camera setup if you change a setting and can’t later recall its original values. This option frees you to be wildly creative and experiment with your camera.